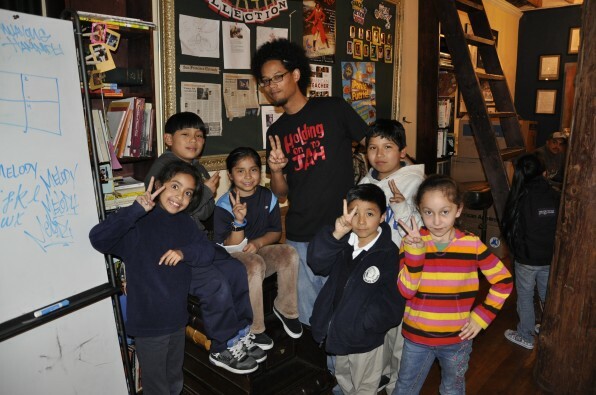 On Tuesday, March 20, the students in our after-school tutoring program took a much needed break from their homework to welcome special guest speaker Robert Trujillo, to our 826 Valencia writer’s room! Robert Trujillo is an artist from Oakland, California, specializing in storytelling, illustration, and mural art. He is also a member of a larger collective called Trust Your Struggle, where he paints large scale murals with community-based artists and organizations. As an individual artist he creates short stories focused on children of color, multi-cultural identity, magic, and fantasy. Through life stories, shared examples of his work, and plenty of fun activities to keep the students interested, Robert was able to show the students that art is simply about expressing yourself. At one point, he even had every student in the room working on their own piece of art! This is the second time this school year that we have hosted a guest speaker during after-school tutoring, and certainly not the last, as we continue to connect students at 826 Valencia with the larger Bay Area artist community.